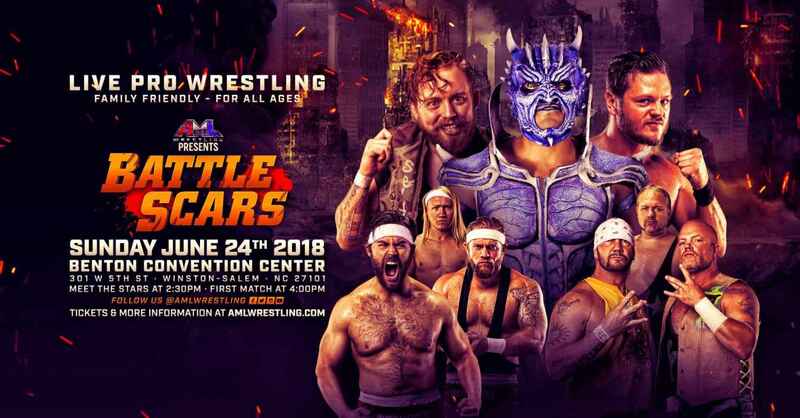 WINSTON-SALEM, N.C. - July 25, 2018 - PRLog -- Battle Scars featured The Stars of AML Wrestling and was held in front of a crowd of more than 350 fans at the Benton Convention Center in Winston-Salem, NC during an AML Wrestling Network TV Taping on Sunday, June 24, 2018. Here are the official results. - Event opened with AML Wrestling Champion Caleb Konley coming to the ring with his best friend Zane Riley. Konley issued an Open Challenge since his announced opponent, Drago, was injured and couldn't compete. George South came out and it initially seemed that he was answering the challenge. However, Riley shockingly attacked Konley from behind while South joined in and kicked him while he was down. Of course, The Dawson Brothers also came to the ring to get their shots in before The Heatseekers stormed out with chairs to clear the ring and rescue Konley. Tired of the shenanigans, AML Wrestling Owner Tracy Myers, made the main event a 6-man tag: The Team of Caleb Konley & The Heatseekers vs the Team of Zane Riley & The Dawson Brothers. AML Wrestling & IMPACT Wrestling Present: Confrontation on Sunday, July 29, 2018. This event will be held at the amazing Triad Stage located 232 South Elm Street in Greensboro, NC. ALL SEATS ARE THEATER STYLE! TEAM IMPACT WRESTLING: Moose, Eli Drake, Eddie Edwards, Matt Sydal, Allie, Fallah Bahh, Suicide, Tessa Blanchard, Sonjay Dutt & Josh Mathews. TEAM AML WRESTLING: Caleb Konley, Zane Dawson, Brandon Scott, Billy Brash, Axton Ray, Chris Payne, Jaxon Stone, Kristen Stadtlander, Yahya, Sean Denny, Devin Driscoll. Also see The Extreme Horsemen defend their AML Wrestling World Tag Team Titles against The Heavenly Bodies. SPECIAL GUEST: WWE Hall Of Famer Tully Blanchard. Seating will be extremely limited for this event and has been a standing room only sell-out for the past 2 years so buy your tickets early. NOTE: If you purchase your tickets on your desktop PC, you can pick your seats BUT you can't pick your seats if you buy your tickets on a mobile device.